The Tatamy PA Blog . . .
What's happening in and around the Borough of Tatamy, PA. Please keep in mind that these thoughts are mine only and in no way should they be interpreted as official meeting minutes or reflect any official position of the Borough of Tatamy (the lawyers didn't make me say that, I beat them to it). The National Weather Service has issued a FLOOD WATCH for our area for what they're calling "Heavy and possibly record setting rainfall amounts." Again - take a look at your situation and assess accordingly. Please be prepared. Do not take this lightly. WARNINGS/STATEMENTS AND ADVISORIES FROM NC INTO NEW ENGLAND." This is a potentially very dangerous situation unfolding. I am meeting with the local Emergency Management officials this evening to review our plans and ensure that we're ready - or as ready as we can be - to ride out the storm. Again - I cannot stress this enough - you need to ensure that you review your own personal Emergency Management Plan. Review your emergency kits. Make sure that you have enough non-perishable canned food and water on hand to carry you through a few days where services may be interrupted. Are your vehicles fueled? Check your yards. It's summer time. Chances are you have outdoor furniture or other decorations that will blow away in periods of heavy winds. I'm going to go back to my Navy days and say that all "gear adrift" (patio furniture, umbrellas, garbage cans, outdoor decorations, flags, etc.) should be secured someplace indoors. If that's not possible, ensure that it's tied down in such a manner as to not blow away and create a potential hazard. If you have them - check your sump pumps for proper operation. Do you have a backup generator? Do you have fuel for it? Please remember - DO NOT UNDER ANY CIRCUMSTANCES OPERATE AN EMERGENCY GENERATOR INDOORS. There will be more updates in the coming days. Call or drop a note if you have any questions. Thanks! In case you've been living under a rock (no reference to the Geico commercial), Hurricane Irene is projected to come up the eastern seaboard this weekend, bringing with it potentially damaging winds and flooding rains. I have scheduled a meeting on Thursday evening with the Emergency Management Team to review our plans and make sure that we, as a Borough are prepared for whatever Mother Nature may toss our way. Think back a few years to Hurricane Ivan - remember what happened then. I'll be in touch after that meeting. In the meantime, it might not be a bad idea to review your own emergency plans - and take an inventory of your emergency supplies (canned goods, batteries, water, etc.) to make sure that you are prepared. PS - did anyone feel the earthquake today? That was, in my opinion, pretty darn cool. Mark Your Calendars! Some Important Dates . . .
FAMILY DAY: Sunday - August 14, 2011. Further details will be announced in the coming days - most likely you will be receiving a flyer in your door / on your doorstep. ANNUAL YARD SALE: Gather up your belongings and get the tables ready. 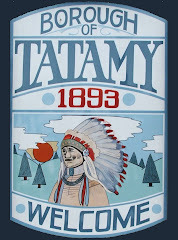 The Tatamy Borough-Wide Yard Sale is scheduled for Saturday, August 27, 2011. SEPTEMBER BOROUGH COUNCIL MEETING: Tuesday, September 6, 2011 (Monday is Labor Day). I will share on this blog my thoughts and some of the happenings around town. I welcome and encourage you to participate with comments, thoughts, and suggestions. For those in Tatamy who elected me, even for those of you who didn't - (don't worry, nobody's perfect and I won't hold it against you), I want to hear from you. I was chosen, by you, to represent your thoughts and ideas on the Council. The only way for me to to do that is to hear from you. Please email me at any time, post comments here, leave me a voice message using that fancy "call me" link you see below (try it - it's very cool), or, if you see me walking around, stop me and say "hi". I look forward to hearing from all of you. In case you think you may have missed something, you might want to check the "archive" section toward the bottom of the page. All the "new" content appears at the top, and the older posts eventually scroll off. Looking For Something? Try Google!